For other people with the same name, see James Lockwood (disambiguation). James Booth Lockwood (October 9, 1852 – April 9, 1884) was an American arctic explorer. Lockwood was born in Annapolis, Maryland to General Henry Hayes Lockwood and his wife Anna. He was commissioned second lieutenant in the U.S. Army in 1873. In 1881, Lockwood signed up for the Lady Franklin Bay Expedition under Adolphus W. Greely, and was accepted as second-in-command. During this three-year expedition, Lockwood led a sledging party, with David Legge Brainard, to Mary Murray Island, off northern Greenland, at a latitude of 83° 24', thus breaking the British record of the time for the most northerly point reached. In 1883, he crossed Grant Land, reaching the western shore of Ellesmere Island. He died at Cape Sabine in April 1884, along with several other members of the party, before rescue arrived on June 22, and was buried at the United States Naval Academy Cemetery. Questia article, citing The Columbia Encyclopedia, Sixth Ed., 2004. Biography at the "Lockwood One Name Study". Accessed March 18, 2010. The United States presidential election of 1884 was the 25th quadrennial presidential election, held on Tuesday, November 4, 1884. It saw the first election of a Democrat as President of the United States since 1856. Governor Grover Cleveland of New York defeated Republican James G. Blaine of Maine. Vitus Jonassen Bering, also known as Ivan Ivanovich Bering, was a Danish cartographer and explorer in Russian service, and an officer in the Russian Navy. He is known as a leader of two Russian expeditions, namely the First Kamchatka Expedition and the Great Northern Expedition, exploring the north-eastern coast of the Asian continent and from there the western coast on the North American continent. The Bering Strait, the Bering Sea, Bering Island, the Bering Glacier and the Bering Land Bridge were all named in his honor. Sir Vivian Ernest Fuchs was an English explorer whose expeditionary team completed the first overland crossing of Antarctica in 1958. Sir John Ross was a British Royal Navy officer and Polar explorer. He was the uncle of Sir James Clark Ross, who explored the Arctic with him, and later led expeditions to Antarctica. USS Jeannette was a naval exploration vessel which, commanded by George W. De Long, undertook the Jeannette expedition of 1879–1881 to the Arctic. After being trapped in the ice and drifting for almost two years, the ship and its crew of 33 were released from the ice, then trapped again, crushed and sunk some 300 nautical miles north of the Siberian coast. The entire crew survived the sinking, but 11 died while sailing towards land in a small cutter. The others reached Siberia, but nine subsequently perished in the Lena Delta, including De Long. Robert O'Hara Burke was an Irish soldier and police officer who achieved fame as an Australian explorer. He was the leader of the ill-fated Burke and Wills expedition, which was the first expedition to cross Australia from south to north, finding a route across the continent from the settled areas of Victoria to the Gulf of Carpentaria. The expedition party was well equipped, but Burke was not experienced in bushcraft. A Royal Commission report conducted upon the failure of the expedition was a censure of Burke's judgement. The Imperial Trans-Antarctic Expedition of 1914–1917 is considered to be the last major expedition of the Heroic Age of Antarctic Exploration. Conceived by Sir Ernest Shackleton, the expedition was an attempt to make the first land crossing of the Antarctic continent. After Amundsen's South Pole expedition in 1911, this crossing remained, in Shackleton's words, the “one great main object of Antarctic journeyings”. The expedition failed to accomplish this objective, but became recognized instead as an epic feat of endurance. Adolphus Washington Greely was a United States Army officer, polar explorer, and recipient of the Medal of Honor. Henry Hayes Lockwood was an American soldier and academic from Delaware who rose to the rank of Brigadier General during the American Civil War and captured the Delmarva Peninsula including Virginia's Eastern Shore and headed the Union Middle Department in Baltimore before returning to academic life at the U.S. Naval Academy in Annapolis, Maryland. The 1881–1884 Lady Franklin Bay Expedition into the Canadian Arctic was led by Lt. Adolphus Greely and was promoted by the United States Army Signal Corps. Its purpose was to establish a meteorological-observation station as part of the First International Polar Year, and to collect astronomical and magnetic data. During the expedition, two members of the crew reached a new "Farthest North" record, but of the original twenty-five men only seven survived to return to the United States. HMS Alert was a 17-gun wooden screw sloop of the Cruizer class of the Royal Navy, launched in 1856 and broken up in 1894. 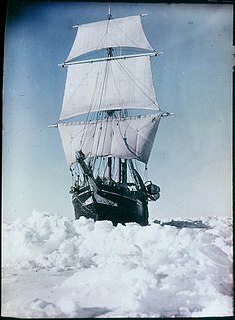 It was the eleventh ship of the Royal Navy to bear the name, and was noted for her Arctic exploration work; in 1876 it reached a record latitude of 82° North. Alert briefly served with the US Navy, and ended her career with the Canadian Marine Service as a lighthouse tender and buoy ship. David Legge Brainard was an arctic explorer and US Army officer who fought in the American Indian Wars, the Spanish–American War, and World War I.
Hazenland or Hazen Land is an uninhabited island of the Lincoln Sea in Peary Land, far northern Greenland. George Walter Rice was a Canadian-born photographer who was first to photograph the Arctic region on the ill-fated American led Lady Franklin Bay Expedition of 1881 to 1884. Rice died in the Arctic on 9 April 1884 while awaiting the arrival of a relief vessel. The Jeannette Expedition of 1879–1881, officially called the U.S. Arctic Expedition, was an attempt led by George W. De Long to reach the North Pole by pioneering a route from the Pacific Ocean through the Bering Strait. The premise was that a temperate current, the Kuro Siwo, flowed northwards into the strait, providing a gateway to the Open Polar Sea and thus to the pole. Thomas Abernethy was a Scottish seafarer, gunner in the Royal Navy, and polar explorer. Because he was neither an officer nor a gentleman, he was little mentioned in the books written by the leaders of the expeditions he went on, but was praised in what was written and was awarded five Arctic Medals. He was in parties that, for their time, reached the furthest north, the furthest south (twice), and the nearest to the South Magnetic Pole. In 1831, along with James Clark Ross's team of six, Abernethy was in the first party ever to reach the North Magnetic Pole.